You are here: Home / Featured / Christ’s Hospital bridleway saved! Following the outcome of a public inquiry the popular bridleway at Christ’s Hospital School has been saved for future generations to enjoy. The school had applied to the highway authority, West Sussex County Council, to divert the popular route across the playing field to a longer, inferior, path around the edge. The council agreed to make a diversion order, using special legislation for moving paths on school land (section 119B of the Highways Act 1980). The principal test which such a diversion order must meet are that it is necessary to move the path to protect pupils and staff from risks to their health and safety. However, the school must be able to demonstrate that it has taken appropriate action to mitigate such risks, and that the diversion of the path would lead to a substantial improvement in that security. Because the order was opposed, by the society, Horsham District Cycling Forum, Horsham District Council and local residents, the council had to refer it to the Planning Inspectorate to determine on behalf of the Secretary of State for Environment, Food and Rural Affairs. A public inquiry was held last July. 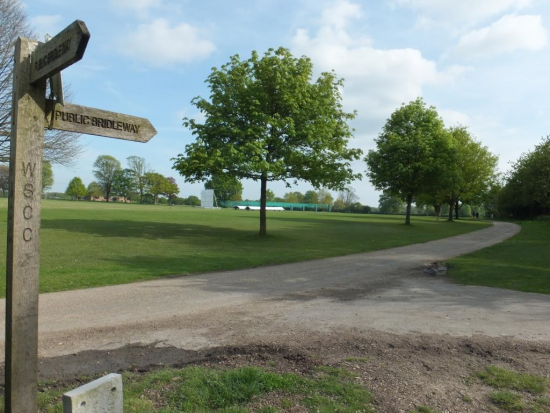 The society argued that even if the bridleway was to be diverted, there would be no substantial improvement in school security and that the number of incidents at the school dating back to 2010 was insignificant. The evidence presented confirmed that the area has a low incidence of crime. Speaking at the inquiry, many residents who were path users confirmed the lack of incidents. Improvements to security have been implemented and more are planned, including an extension to CCTV systems. The inspector, Susan Doran, agreed with the objectors and refused to confirm the order because she did not consider it would result in a substantial improvement in security. In reaching her decision, the inspector also considered the implications of the National Planning Policy Framework, revised in 2018, which seeks the protection and enhancement of public rights of way and to provide better facilities for users. We are grateful to Claire Vickers, the Cabinet Member for Planning & Development at HDC for the sterling work she did in helping to win the case. Members of the forum will be meeting with Claire next month to discuss how to make the best use of the bridleway. Our ambition is to have a sealed, all-weather route from Worthing Road to Christ’s Hospital station. This will give people from the northern part of Southwater a direct, safe, off-road cycle route for commuting and leisure. Since it is a shorter route than going by road, a good surface will make cycling a realistic alternative to driving the car through busy lanes and having to pay for car parking. That’s good to hear, but how will it be possible to persuade Christ’s hospital to help make a sealed surface off road route to the station? My understanding is, is that at the moment the western part of the route, linking into the downs link, is a muddy bog which needs quite a bit of investment. Very Good News because we REALLY need to improve, properly link up and value our cycling infrastructure.